What a difference a week makes - from below zero temps and ice galore to spring-like weather (yes, it soared to 60 degrees in parts of Connecticut yesterday). We have experienced a true meltdown in Westport. While this drastic fluctuation weather conditions offered Westport residents a welcome reprieve from old man winter, it comes with a price (and sometimes our vehicles pay it). 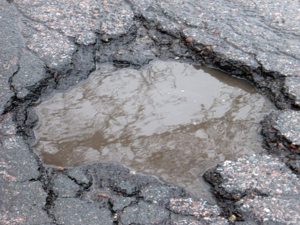 You guessed - the structural failure of the very roads we travel on - POTHOLES.